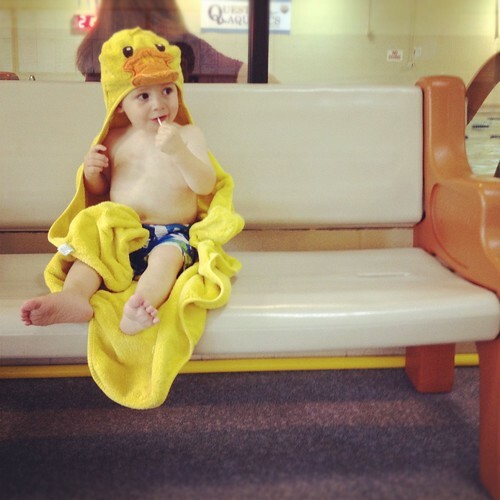 Last week little man had swim lessons with a local acquaintance that offers swim lessons. He cried throughout the entire lesson. The person that gave little man lessons doesn't teach children under two so I signed up Cohen for infant survival swim lessons. These lessons are 4 days a week for 4-5 weeks. We have to drive 30 minutes each way to get to them. We figured since we were driving out that way anyway that we'd sign little man up for more lessons. Little man seems to be really responding to swim lessons now and is already able to swim to the side! Cohen too is already able to swim to the side from a short distance. I can't wait to see where they are on their test out days! To test out of the class the boys have to be able to swim fully clothed to simulate accidentally falling into the pool.